The Majlis speaker attended the opening session of the summit on Sunday and met with a number of his counterparts and other senior officials on the sidelines of the forum, according to Financial Tribune. 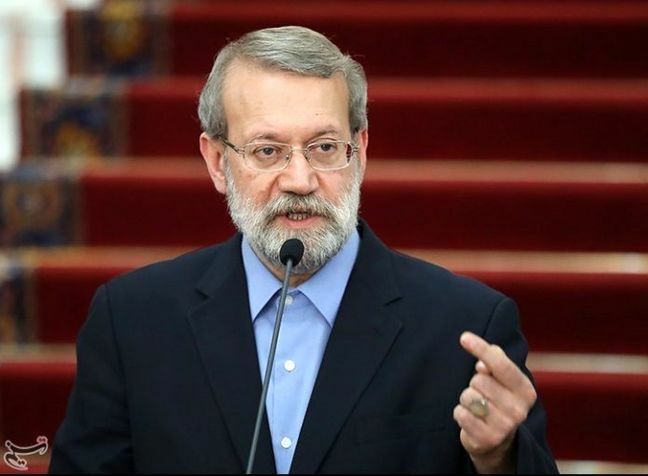 During his talks with Iraqi Parliament Speaker Mohammed al-Halbousi on Saturday, Larijani said the two neighbors are engaged in a very “significant” and “constructive” cooperation, ICANA reported. He added that Tehran and Baghdad should continue to utilize their potentials to strengthen relations in all fields, despite difficulties caused by US sanctions against the Islamic Republic. The US administration is pressuring Iraq to stop buying energy from its sole foreign supplier, Iran, in what has become a major point of dispute between the United States and Iraq. Halbousi hailed the achievements of President Hassan Rouhani’s first official trip to Iraq in March and said his country plans to host a meeting of senior lawmakers from neighboring countries in the future. “Iran’s participation could provide a great opportunity to help expand cooperation on regional and international issues among these nations,” he said. Several preliminary trade deals were signed during Rouhani’s visit to Baghdad, which was meant to bolster commercial ties despite US efforts to isolate the Islamic Republic. They included agreements on oil, trade, health and a railroad linking the southern Iraqi oil city of Basra and the Iranian border town of Shalamcheh. Iranian and Iraqi officials also agreed that travel visas would now be free of charge and pledged to make it easier for businessmen and investors to obtain visas. Larijani held a meeting with Lebanese Parliament Speaker Nabih Berri on the same day, in which they called on Arab countries to take firm action against Washington’s recognition of Beit-ul-Moqaddas as Israel’s capital in 2017, which sparked a wave of global condemnation and protests. The Majlis speaker also held separate talks with a number of other officials on Sunday, including Qatari Prime Minister Abdullah bin Nasser bin Khalifa Al Thani and Russia’s State Duma Speaker Vyacheslav Volodin.